Serving as an outdoor community space since 1882, the one-acre site first hosted the Free School Society’s Public-School No.5, which provided free night classes for people of color in addition to regular schooling. 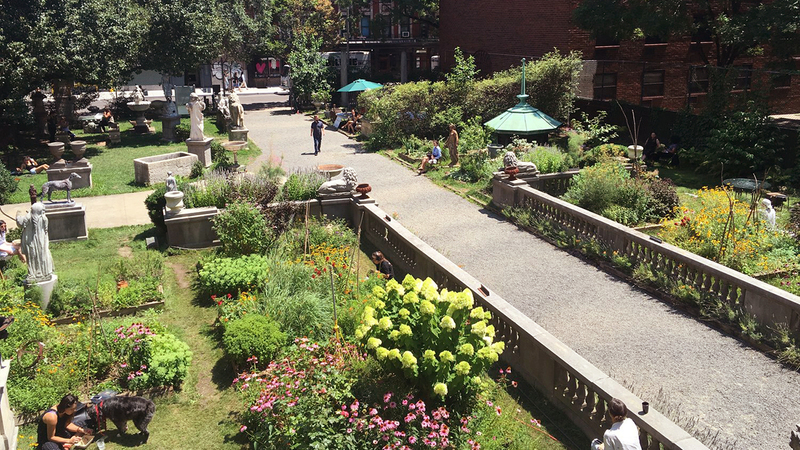 The space became an important community amenity, with public education lectures being held frequently. Eventually, growing demand resulted in a larger school being built in 1904, named Public School No.21 (P.S. 21). Designed by school architect Charles B. J. Snyder, the new school featured an outdoor kindergarten with an enclosed terrace and a flower garden in the northeast corner of the playground for students to enjoy fresh air. Although by 1927 the school had expanded to fill the entire city block (Lot 41) it was eventually demolished in the 1970s. Two-thirds of the three-acre Lot 41 were eventually developed into apartments in 1981, and the remaining area was leased to Elizabeth Street Gallery owner Allan Reiver in 1991. 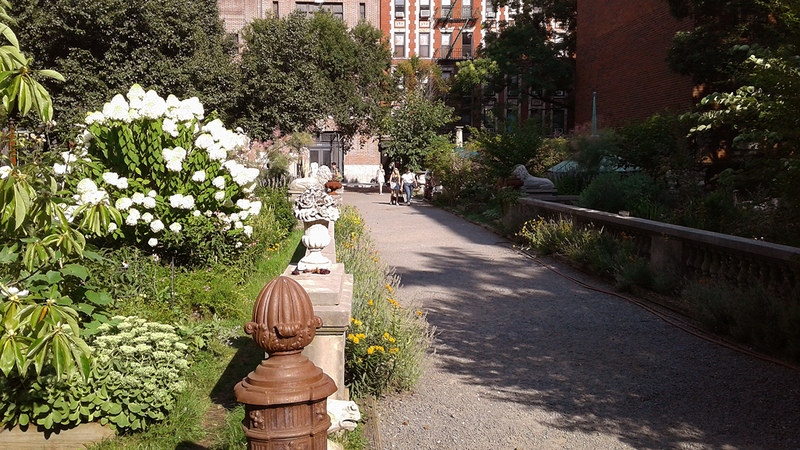 Reiver developed the space into a community garden featuring neoclassical sculptures from his own collection. Linking the L-shaped garden to the street, the main gravel path is edged with a stone-and-granite balustrade designed by French landscape architect Jacques-Henri-Auguste Gréber. 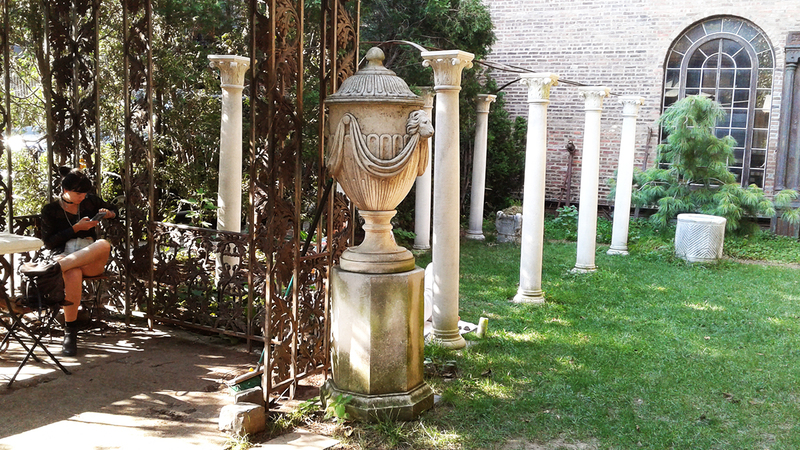 The balustrade was removed from the 36-acre Lynnewood Hall, considered to be one of the largest Gilded Age mansions in the Philadelphia area. 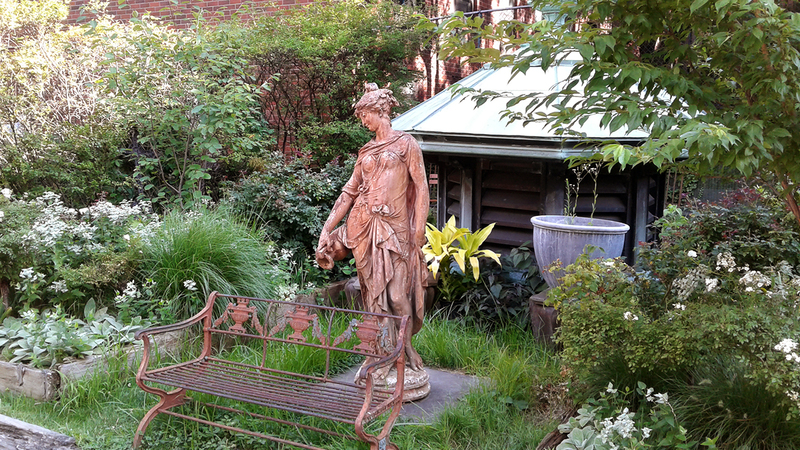 Pear trees, cement lions perched amid overgrown rose bushes, and beds of black-eyed Susans interspersed with the statuary give the space a whimsical quality. A copper gazebo, with wreaths of iron flowers, designed by Olmsted Brothers for Burrwood (the former home of Walter Jennings) stands beneath the trees, while a small sheltered space used for public programs and exhibitions abuts the rear wall. Dating to 1883, the adjacent firehouse in which the gallery is located was designed by Napoleon LeBrun, official architect for the New York City Fire Department.